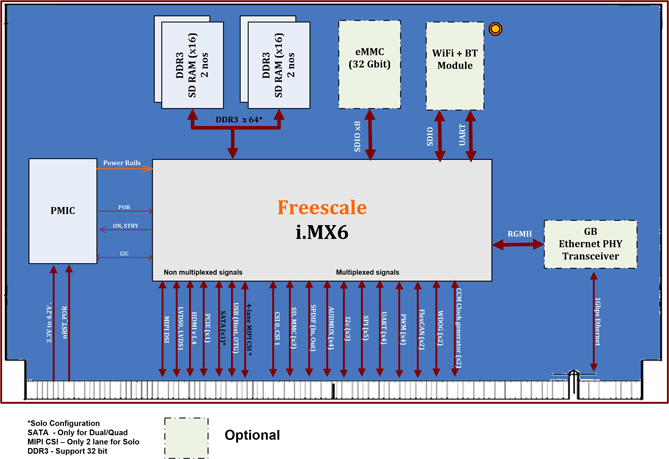 i.MX6 SOM - eSOMiMX6 is a high performance system on module based on NXP/Freescale i.MX6 Quad/Dual/DualLite/Solo ARM® Cortex™-A9. 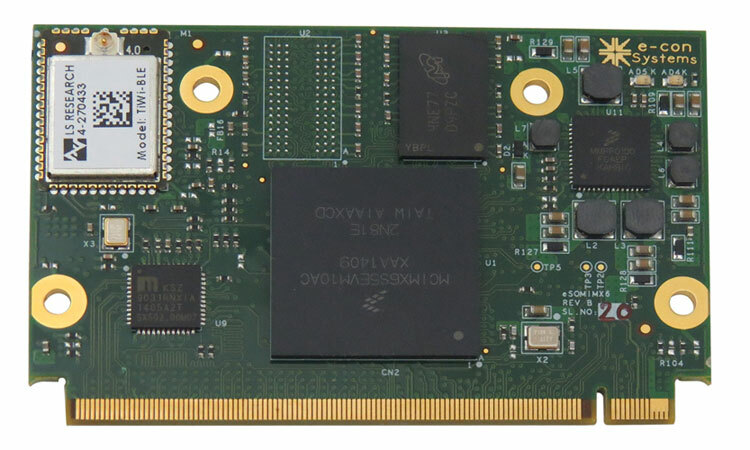 The i.MX6 SOM has i.MX6 CPU running up to 1GHz - Quad Core, DDR3L SDRAM configurable up to 4GB and eMMC flash with capacity configurable up to 32GB. 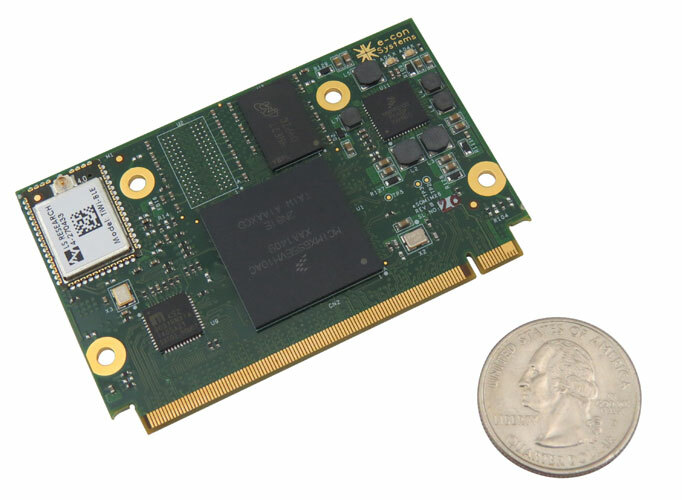 The eSOMiMX6 System on Module also has Wireless LAN and Bluetooth module. 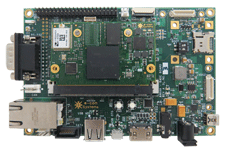 This iMX6 SOM supports Android, Linux. eSOMiMX6 System on Module is aimed at reducing the time-to-market for our customers by making use of the stabilized and ready-to-market iMX6 modules in their applications. e-con provides a Rapid development kit for eSOMiMX6 called Ankaa i.MX6 Development kit. 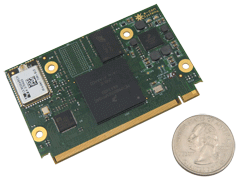 This Development kit features a carrier board around the eSOMiMX6 Module with peripherals supported like HDMI, LVDS, USB 2.0 host. Also includes 7 inch Capacitive Touch screen, SDIO, SPI, I2C, GPIO, USB high speed client, 4 lane MIPI/Parallel camera interface. eSOMiMX6 can be customized with the following configuration. x-variants can be chosen from the following eSOMiMX6 Part Number Decoding Table. eSOMiMX6-CS-P1G-F4G-R1G-WB-E and eSOMiMX6-CQ-P1G-F4G-R2G-WB-E are available for samples from webstore. For the other configurations, the Minimum order quantity (MOQ) is 100. please contact sales@e-consystems.com for more information. * - Available in 8GB (F8G), 16GB (F16G), 32GB (F32G) versions. » Worried about your software upgrade?